V&V Nursery Garden Center - V&V Nursery Greenhouse & Garden Center West Michigan, Greenhouse, Garden Center, Specializing in Annuals,Perennials, Proven Winners, Unique Hanging Baskets and Combination Patio Pots. 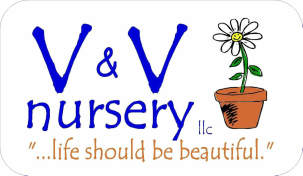 V&V Nursery is a team operated business that enjoys growing plants and helping others grow beautiful gardens. We take pride in offering the highest quality plant material that is carefully grown and nurtured with the proper nutrition, so you can enjoy growing flowers with ease. Two brothers, Jerry and Pete VanDerKolk, established V&V Nursery in 1990. The brothers (15&13 years old) actually began selling perennials in 1987 on a roadside wagon in Jamestown. After years of great success, expanded to the Jenison location in 1990, with a help-yourself moneybox stand. Thanks to all of our returning customers we broadened our plant selection to over 500 varieties. We now carry trees, shrubs, annual flats, gorgeous hanging baskets as well as gardening necessities and of course perennials. In 2001, V&V Nursery purchased the old Naffziger Greenhouse & Floral located in Cedar Springs. In 2010, V&V Nursery launched NewGardenPlants.com, an ecommerce online garden center. We now ship plants all over the United States. The team would like say "thank you" to all of our customers for allowing us to do what we love!! Thank You Very Much!! !